Author and Blue Hill Heritage Trust Executive Director Hans Carlson looks out from Kinsman Mountain in New Hampshire. 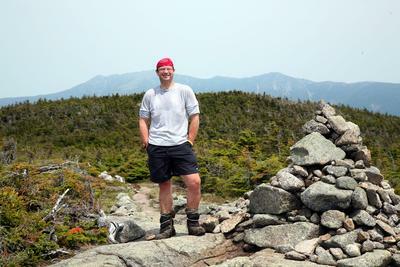 Carlson recently published Walking Toward Moosalamoo, based on his experience hiking from Katahdin Mountain to Mount Moosalamoo, Vermont over three summers. How do humans relate to nature? The answer is intertwined with economics, politics and culture, according to author Hans Carlson. “It all comes down to the stories we tell, our relationship to the land,” he said. Carlson, executive director of Blue Hill Heritage Trust, recently published Walking Toward Moosalamoo, based on his experience hiking from Katahdin Mountain to Mount Moosalamoo, Vermont over three summers. But, with a Ph.D. in Environmental History from the University of Maine and stints teaching at three universities, including the University of Maine at Orono, Carlson’s book is about much more than a long walk through the woods. Each of the 39 chapters is tied to one day’s hike and begins with a meditative, personal reflection before diving into a broad range of environmental history, politics and culture. For Carlson, the environment is “not just another ‘ism’” but the context within which human politics has to fit. Carlson began writing the book eight years ago, based on the journal he kept during his foot travels. Originally, he planned to write a straightforward book on environmental history, focusing on the Darwinian view of nature. “I didn’t expect to be talking about early civilization, and the roots of Western culture,” he said. A writer and outdoorsman from a young age, Carlson said his love of outdoors was always defined by wilderness. Animals are a big part of those stories but often ignored as humans work to tame nature to fit economics and politics. Carlson is not okay with the idea that humans are rational and animals purely instinctive, based on evidence of community, family structure, and analytical problem-solving in different species. The current problem of violent, rogue elephants in Africa is not based on their animal nature but from the breakdown of the family structure from poaching, leaving young male elephants on their own, “running around, causing damage,” Carlson said. Carlson said he finds the process of writing exhilarating and also occasionally deadly and grinding. While Carlson didn’t plan for the book to be as personally reflective as it turned out, he said he has always written from his personal perspective. “Even in my academic writing, I’ve never been able to not speak in the first person,” he said.